In our previous post we discussed the various styles of spaced board wood fences. Another style of wood fence is a board-on-board fence, in which fence boards are attached in an overlapping manner on the same side of the rail. This overlapping design means there is no space between the boards and ensures privacy from the fence. The board-on-board style can also occur on alternating sides of the rail, which still provide some space for a breeze to pass through while providing strong privacy. This style of fence is referred to as a “neighborly” fence because both sides of the fence look the same, ensuring your neighbors sees the same fence type as you do. This type of fence provides a unique look, particularly when the rails are on the top and bottom of the boards. A tongue-and-groove wood privacy fence is similar to a vertical board fence in which the boards are placed next to one another. In the case of a tongue-and-groove fence, the edge of the boards are cut to fit into one another, which allows not just blocking a view into a backyard, but also for strength in a privacy fence. 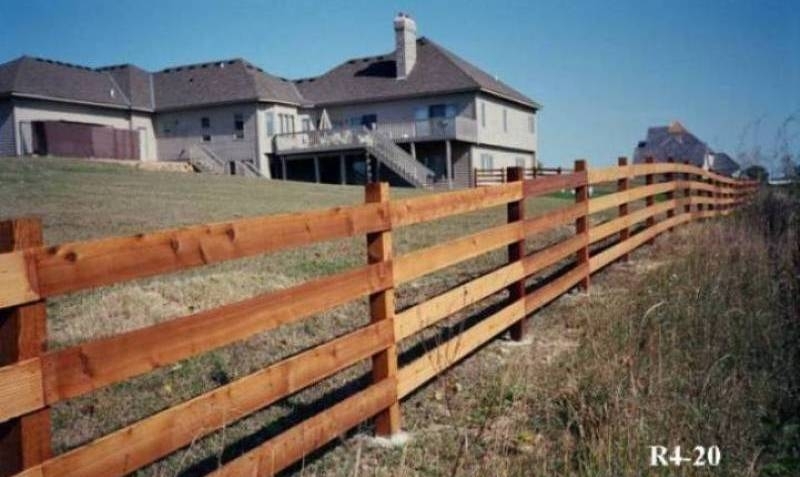 While the previous fences in this post offer privacy or semi-privacy in a fence, a split rail fence is mainly for decoration and as a property line market. A split rail fence use rough cut boards that fit into holes put into the posts. They are typically two boards to the fence, which provide a rural, western look-and-feel to a yard. The fence also marks the edge of a property. A rail fence attaches the rails to the posts in the traditional manner, but no vertical boards are put in place. In our next post we will look at other ways a privacy fence can be given a unique look.